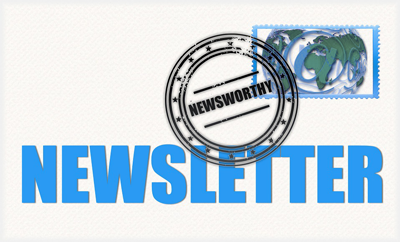 You are here: Home / Blog / Uncategorized / Painful exercise in rehab – Yes, no or a lot to think about? Whether rehab exercises should be painful or not has become a recent topic of much discussion. As we have started to value the role of (optimal) loading in rehab, and that we can get patients back to moving and loading pretty early in the rehab process, we have also got to appreciate that this is unlikely to happen without experiencing any pain. If you have any type of understanding about pain then the simple question of “should we use painful exercise?” suddenly might not look so simple! Rather than a simple yes or no, there are a bunch of questions to be answered, such as how much pain is OK? Who may or may not benefit? And what is the best way to manage the process? Especially if all does not go to plan! From a data standpoint it would be great if we had have something that we can use to guide us here. Low and behold we do, and its open access. Smith et al looked at this question in 2017. This systematic review and meta analysis looked at 9 trials in which varying degrees of painful exercise were used. They found that painful exercise did NOT result in statistically worse outcomes across a short, medium or long term follow up. There was a small statistical benefit in the short-term for painful exercises as highlighted by the standardised mean difference of around 0.2 (SMD = effect size for a meta analysis). So from a research standpoint this is positive news. One thing to note here from a clinical standpoint is, that using painful exercise is no GUARANTEE that it will have a positive effect for your patient. All statistical tests only give us the PROBABILITY of an effect, so the likelihood is that it will, but when we look at the confidence intervals (measure of variability) for the mean SMD for painful exercise, for the majority of the studies we can also see that they cross into a negative effect and in some of the studies quite substantially. The variable effect of exercise on pain (although over a shorter time frame) was also shown by O Neill et al's recent look at the acute effects of isometrics *Here*. Although, of course, isometric exercise and painful exercise is not the same thing, the point here is the highlighting of the variable effects from exercise. For patients with higher baseline pain isometrics actually increased their pain post exercise and this is the benefit of looking at individual responders within a study not just the group average. Those with lower pain at baseline seemed to receive more analgesia from isometric exercise. BUT at the very least I think we can say that the likelihood is that it will not have detrimental effect. So as rehab can often be painful we can be reasonably confident but without seeing painful exercise as some sort of fire and forget panacea and also appreciate the individual nature of pain. We could debate the mechanisms of HOW painful exercise might work from pain habituation to conditioned pain modulation and perceptual mechanisms but in essence we don’t really know at this point in time and this might be different or in different combinations for different people. The benefits can be both physical AND psychological. Firstly, it allows patients to get in MORE exercise. If they are not being limited by pain (or pain contingent if we are being fancy 🙂 then they can get a greater dosing than if they stopped due to it being painful. It is important to add though that we currently don’t know what optimal dosing is for exercise having an effect on pain! Secondly, it sends the message that hurt does not equal harm. The problem can be painful and still settle down if managed in the right way. This may give people a new insight into their pain and how they can manage it. Pain self-efficacy may also be built experientially, so using painful exercise as a tool might be an option to help do this. So it’s great to have some objective data on this subject, but as we know getting that into clinical application is not always straightforward. Firstly don’t be afraid of some pain! The likelihood is that it won’t cause a worse outcome. But as we are dealing with thinking, feeling HUMANS, it is OF COURSE not as simple as this, but more on that later. One of the issues with always looking to be pain free with exercise or continually treating pain, is what does that say ABOUT pain? On one hand we are telling people hurt does not mean harm but our actions might not be saying the same thing. If pain is OK, if it is normal then in the process of getting it better we might have to endure a little bit of it. But how much is OK is a key question? Studies that have allowed painful exercise have ranged from not increasing baseline symptoms during or post exercise up to 5/10 on the VAS. 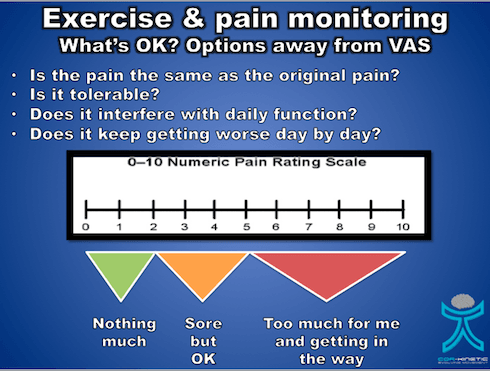 We know the limitations of the VAS as a REALLY subjective scale so perhaps we could introduce the idea of pain being tolerable or intolerable rather than a numerical score. Now tolerable might be a bit sore but it does not really get in the way. Intolerable might be thought of as getting in the way of our daily activates, maybe having an effect on our sleep and generally making life a bit miserable. This is going to be different for different folk so hence why the concept of tolerable becomes important. So on the issue of DOMS, it is important to identify if the increase in pain is actually the same as the original symptom. Post exercise soreness is quite normal but for those that are unaccustomed to exercise this might not be recognisable especially for a currently painful area. Defining what is pain and what is soreness might be a good sense making exercise for some patients. Although we don’t know that progressive overload is required with exercise in rehab, it probably ia a good idea, so having some sort of tolerable baseline for patients to progress or regress from is a great idea too. This is also might have an effect their self efficacy using exercise too which, of course, is a bonus. Potentially the most problematic area with painful exercise, and one that is really under discussed, may be more about the psychological aspects that are associated with the pain and how they can affect the person. One of the best prognostic factors for recovery in a number of body areas appears to be pain self efficacy, *here* is a recent paper from Chester et al and also from Foster et al *here* Pain self efficacy, something I have written about before also *here*, is the ability to carry on normal functioning despite of pain. It is important to note that those with higher pain self efficacy also tend to adhere to exercise better. So someone’s pain self efficacy is going to be a KEY factor in whether they are able to tolerate having pain and being able to carry on functioning which maybe a fundamental skill at the heart of painful exercise especially if it can take 24-36 hrs to settle. Predicted outcome is another key prognostic factor and if someone believes that increased pain will result in a negative outcome then this could have a negative effect on the actual outcome. Jack et al *here* found that the number one reason for poor adherence to exercise programs was that people did not want to make the problem worse. So painful exercise coupled with negative beliefs about pain, low pain self efficacy and a poor predicted outcome may not sit well together. A qualitative piece “Exploring experiences, barriers, and enablers to home- and class-based exercise in rotator cuff tendinopathy” from Sandford et al also found that a fear of making the issue worse was a key factor in reduced adherence to exercise. Firstly you could screen people for these factors if you feel they are required. We have tools such the Pain Self Efficacy Questionnaire (PSEQ) and the shorter version the PSEQ-2. One caveat with using questionnaires, in my opinion : ), is it does allow us to get a score to assess confidence and resilience in managing pain but it perhaps does not tell us about things that are specific to our patients. So being able to weave this into a good subjective that teases these more personal parts of the narrative out is a must. It might be that someone tells you that they have tried exercises before and they did not work or that they feel it might make the issue worse, especially if it hurts. It might also be important to discuss with ALL patients what their beliefs are around pain. These might be that pain indicates they are doing more damage to their bodies or they will not be able to work because they have pain or implications for future functioning. It can often be what the pain MEANS to the patient that is the real issue rather than just the sensation of the pain itself. One of the most powerful tools we have at our disposal is EDUCATION, I am not always a huge fan of this term as it can imply a teacher pupil relationship. But in order to provide effective education to people we first have to build rapport and then understand what they may need to know more about. We can educate on a range of things from the effectiveness of exercise for many issues, that painful exercise is often not detrimental, that pain self efficacy is an important prognostic factor and what pain may actually mean and its relationship with physical damage. It may also be worth talking about the process and what to expect, and often that it is a process of trial and error to get the right level and desired response. This has to start with understanding the patient, their history and belief structure. Do we have to jump straight into painful exercise? I don’t think so. It is not REQUIRED but it is also not harmful. An important point to make is that for someone with very negative beliefs about pain, reduced pain self efficacy and poor beliefs about the outcome, challenging them right off the bat with painful exercise might not always be the best thing to do. As they build trust in you and confidence in their bodies then pushing into pain progressively might sometimes be a better route. We know that giving people the option to avoid pain can actually maintain pain avoidance, so whilst not advocating avoidance behaviour confronting these things may take a little time, confidence and education, especially if the person has a lot of negative pain and avoidance based beliefs. Those that persist in doing painful things that have NOT provide a therapeutic effect may benefit from non painful exercise for a while too. If you feel that pushing into pain has not given the desired response when looking at their history then a break or change in dosage could be just the ticket. Those with higher levels of pain at baseline on average seem to have worse clinical outcomes so this might also lead me to reason that maintaining this level of pain through exercise might not always be a good idea. There are no real hard and fast rules here only individuals and individual considerations. What if it all goes wrong??? This is where self efficacy may come into its own. Empowering your patients to self manage maybe valuable in the exercise process. So do your patients know what to look out for in terms of symptoms? Do they know how to adjust the dosage? This could be in exercise frequency, intensity and time, sets and reps (volume). Are they able to contact you to ask questions? Do they know this? I think these are all required aspects of pushing into pain. A patient I saw last week had religiously persisted at pushing into his painful rehab exercises every 48hrs. He believed if he did what he was told he would get better (the trust!). But after 3 months there was not the desired outcome. In this case he was given no indication what to do if this happened, just blind faith on all sides that he would get better. It is not just about the PAIN sensation! What does the pain mean and how does it affect behaviour such as exercise adherence? It does not need to start with painful exercise!